I have been having so much fun lately playing and experimenting with the new pouring medium. I wanted to try it on a 3D surface and remembered a paper mache mask I had in my stash. 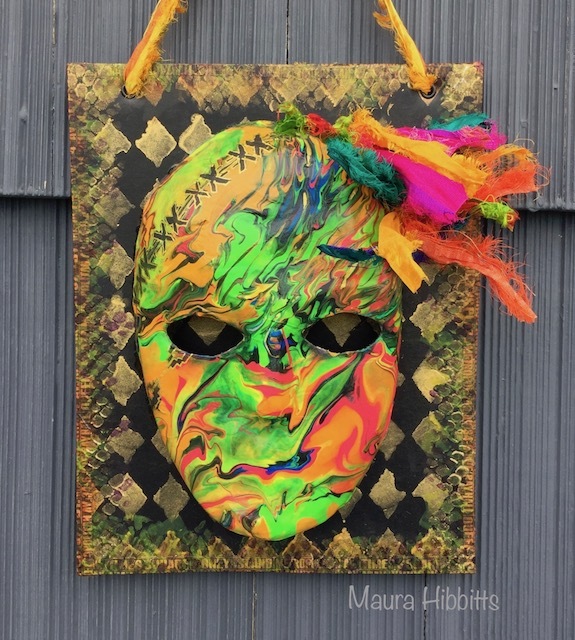 I think I was inspired to work with the mask because of a conversation I’d had recently about New Orleans, and that made me think of Mardi Gras and masquerades. Step One: Mix paints and Pouring Medium into small cups at a 1:1 ratio (ratio for craft paints). Use a popsicle stick to stir. Place mask in the tray on props and prepare to pour. Step Two: Drizzle black and blue paint over the mask. Then drizzle on green paint. Swirl paint over mask by tilting in various directions. This is the step to wear gloves if you don’t like getting messy. Step Three: Now drip on the yellow, orange and pink mixtures in a random fashion over the mask. Tilt and shake back and forth until you get the pattern you like. You can always add more paint at this point in any of the colors for your design. Step Four: Take the texture tool and draw it through the paint on a section of the mask. I did this in a wavy pattern. You’ll also see me fooling around in the mask having fun. Step Five: Tape the Aztec stencil down over the mask with the artist tape to hold it in place. Sponge black paint on the portion of the stencil you are using. When dry, go around the design with a gold pen. I also filled in a few small areas with gold pen on the mask where there was no paint. Step Seven: Punch several holes through a section of the mask and tie on bits of sari ribbon. Step Eight: Use a glue stick and adhere washi tape around the edge of the cardboard. (This will help hold it in place) Brush Quinacridone Gold over the tape and smudge onto the edges of the stenciled area. Use the Shedded stencil around the edge of the frame and sponge on Green Gold, Payne’s Grey, Dioxazine Purple, and then Interference Gold in a random fashion. Punch two holes at the top, attach black eyelets, then thread a large piece of sari ribbon through to hang it. Glue the mask to the cardboard. I really like the unexpected “ah ha” moments when I use the Pouring Medium. I find it hard to determine when to stop moving the paint around...maybe I just get mesmerized by the flow! I do know I have a lot of fun playing with it and I know you will too. Be sure to visit TwoCraftingSisters for more projects and to learn more about Maura Hibbitts. OOh I am loving the colours in this! Fabulous effect.